This post is a wee bit different than my usual, but it's one I hope you will enjoy and maybe even resonate with! I have had big dreams of learning to sew over the past few years, and I keep setting intentions to do it. But being a one-woman business and a mama to two babes under 4, doesn't leave much "me" time. Sewing a garment for myself felt selfish and I just couldn't justify taking the time for it. But if I can get really honest here - I know that is not a healthy way to think. After a year of struggling with postpartum depression I have begun to take self care a lot more seriously. How can I take care of my loved ones, when I am struggling to care for myself? I've started small by prioritizing a 30 minute walk or run every workday. I've also been trying to get back into the kitchen, as I love to cook and know I feel so much better when I am eating food cooked at home. These little everyday things completely change my outlook on life. Well, after traveling, teaching, and designing - I got home and was feeling pretty drained. Thankfully, I had Meg McEwee's new pattern - the Metamorphic Dress, ready and waiting for me. I knew I just needed to push aside all of my excuses and schedule in my sewing time. As I washed, ironed and cut my fabric, I could feel the stress start to melt away. Excitement built as I began sewing, and I realized I was completely filled with joy. The joy of making just to make. The awe of watching my own hands create something beautiful to wear. It was pure glee when trying it on for the first time and realizing IT FITS! But wait, not only does it fit - but I LOVE IT!!! Y'all - I have worn this dress every day since I finished it! And each of those days I felt confident, proud, and totally filled up. I am so grateful that I finally took these precious moments, and even more so to the other artists out there that inspire me to create! I've already cast on a new oversized cardi design to pair with my Metamorphic dress! In these photos (snapped by my amazing husband, Peter Mowry (@petermowryphotography) while out playing with my kiddos), I paired my dress with my Kingsley hat and Raina Shawl (from the current issue of Making). I hope you all had a wonderful holiday weekend! We are kicking this week off with such an exciting pattern release! Ever since I finished my Find Your Fade shawl, I knew I needed a faded sweater! I was so inspired by some gorgeous yarn I had bought from Primrose Yarn Co a few months ago, and the So Faded sweater jumped on my needles and pretty much knit itself! The first (of 3!!!) that I knit, I opted for a cropped fit. It is perfect for layering over collared shirts and dresses or worn with high rise jeans and (my personal favorite) overalls! I knit the sleeves to just about the elbow which is perfect for transitional seasons - hello Spring!!! To celebrate this pattern release I am offering 15% off of all of my Faded patterns! Use the coupon code FADED on So Faded, So Faded Pint Sized and the Find Your Fade shawl until this Friday, 4/21/17 at midnight EST! 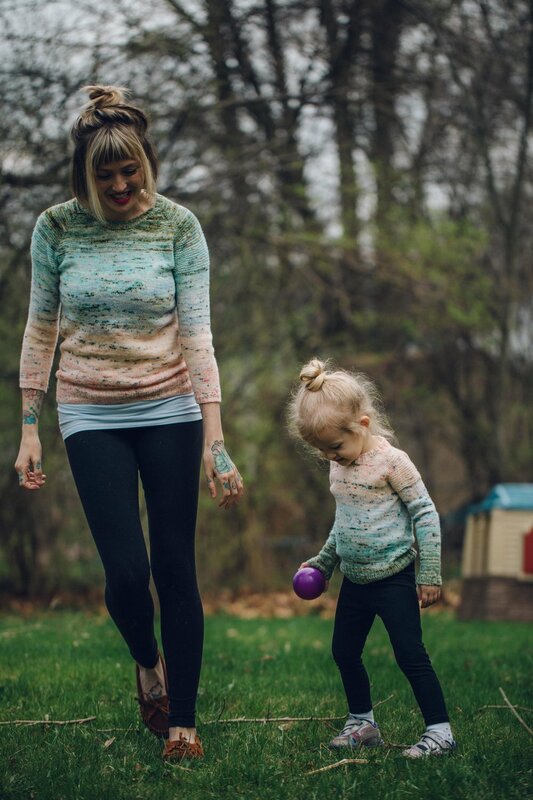 Keep your eyes out for amazing So Faded kits from awesome indie dyers! Custom kits will be available thru Kitterly.com, Hue Loco and Woolen Boon - just to name a few! Psssttt...later this week I will be sharing a very special interview and giveaway with Nicole from Hue Loco! Om & Yoga Shawls KAL Wrap up!! Sarah's Yoga shawl makes me want one in gray! You can check out more projects over on Ravelry, and we would love to have you join our next KAL - the Anniversary KNIT in COLOR KAL!! Congratulations to Karen Stocks - the winner of the KAL giveaway prize!! Brittany's beautiful neutral and marled Om shawl! Anne's bright Om Shawl knit with Plucky is amazing! Julie's Plucky Knitter Om Shawl is beautifully unique! Love this Navy Blue with pops of color by Amber! Wow! Katharina also knit up a Yoga Shawl! Beautiful Yoga shawl by ARockandaTree using yarn she dyed herself! I love Rebecca's Hinterland Om Shawl!! Dana's multicolored Yoga Shawl is so inspiring! Alexa is such a cutie in her Om Shawl! We Are Knitters // Mushy Vest & Giveaway!! Apparently, I am all about quick bulky knits these days! And expanding the color palette of my wardrobe! Here is my latest finished object - the Mushy Vest from We Are Knitters! Knitting kits have come a long way since my teen years! I was so impressed with the options available, everything from blankets and pillows to sweaters, hats and baby knits (Hello, Teddy Sweater!!). My kit came with all the yarn I needed, wooden needles (definitely nicer than the aluminum needles of my youth ;), directions for the pattern, a label to sew into my completed vest, and a darning needle to sew the pieces together. In other words, everything I needed to complete my project. These kits would make awesome gifts for any knitter in your life (or a gift for yourself!) They come with everything you need and everything is high quality. The patterns are all modern and fun. And the really exciting news?? I get to give one away!! To enter for your chance to win the kit of your choice (up to $100), just leave a comment below telling me which kit you would pick and make sure to leave your email address in the comment! The contest will close Saturday, February 2/20/16 at midnight EST. Can't wait to get your hands on your own kit? You can use the coupon code DREARENEE to save 15% off of your order at www.weareknitters.com! You can also find their fun and inspiring feed on Instagram! Want to see some more pictures of my finished vest? Head on over to my Ravelry project page!! I have a strong tendency to lean towards greys and greens when knitting up sweaters for myself, so I pushed myself to go against my norm with orange. I am so happy I did. What a fun addition to my wardrobe! This knit was super fast. This sweater could easily be knit up in a weekend. The result is a bulky knit sweater, that doesn't leave you feeling like you just added 10 pounds of bulk to your frame (huge win!) I love the deep ribbing for the neckline, hem and wrists. The directions are very simple, and easy enough for a beginner. I would happily knit myself a couple more of these! I will have to see if, sans belly, the torso is long enough next fall. I am very short waisted - so I think it will be okay, but luckily, I have a whole extra skein of the Puffin if I decide to add some more length! To see more pictures, you can hop on over to my Ravelry project page!